Organizations are increasingly structuring their procurement in terms of key categories. This new state of play presents a range of opportunities, as well as challenges, for the seller. Above all else, it means the salesperson must work to make the category manager his or her friend. The following article shows how this can be achieved. “There would be no Tiffany’s if people were naturally good at buying”, remarked a senior manager in one of the world’s largest procurement services companies. “If people liked to negotiate, such a shop simply couldn’t exist”, he added. I shook my head in disbelief – hadn’t this professional buyer heard of category management?!? How the richest of the rich buy diamond rings has got nothing to do with how procurement executives go about purchasing office stationery, cleaning services or just about anything else. In the category that is high-end diamond rings – where price matters less than prestige – Tiffany’s makes perfect sense. To compare it with buying in general, however, is simply wrong. The principle involved here is a tenet of modern professional buying called category management. A hallmark of buying sophistication, it states that how the buying decision is reached (including all relevant criteria, the various steps involved etc.) should vary from one category to the next. Put simply, it centers around the fact that buying a commodity is very different to buying capital equipment – just as buying, say, consulting services differs greatly from buying stationery. Moreover, there are different sets of supply market conditions, business drivers and buying criteria involved in each key category, and an appreciation of these factors requires a level of specialized knowledge and skills. Aggregate spend into key categories – what some might call ‘spend pools’. Analyze how much is being spent within each category, as well as the value of what’s coming in. Identify how best to buy across each category, i.e. the level(s) of skill/expertise required. It’s important to point out that the highest level at which categorization can occur is between direct and indirect – that is, between those items that are directly consumed in production and those that are not (a classification similar in many ways to that for direct and indirect costs). By specializing within a particular category, procurement executives have the opportunity to develop category-specific knowledge, processes and skills. Indeed, they may already be experts in a given category, with a growing number of category managers being recruited for their specialized knowledge and experience. Perhaps unsurprisingly, category managers are more likely to be experts. Increasingly, those responsible in large organizations for buying consulting services are now being recruited from consulting backgrounds, while those buying, for instance, print and packaging are being recruited from the print industry. Those category managers, meanwhile, who have switched from the role of supplier to that of buyer are akin to ‘poachers who have become gamekeepers’. If the category buyer is not already an expert, then the likelihood is that he/she will quickly want to become one. Unlike the procurement executive who today buys stationery and tomorrow buys software, the category specialist is motivated to develop and deepen his/her knowledge of the particular domain for which he/she is responsible. Fundamentally speaking, if the specialized procurement skills are not available within the buying organization itself, then the organization may well have recourse to external advisors in shaping the buying decision. Indeed, this has become a major trend in recent years – the use of category-specific consultants, experts or analysts to supplement internal buying skills. Sellers frequently complain of having to deal with procurement bureaucrats who seem to know little about the specifics of what is being purchased. This is often a frustration they share with the manager-buyer, who is usually required to consult with (or perhaps defer to) procurement before making a decision. All of which is not to deny that category buying can and does pose several challenges for sellers. 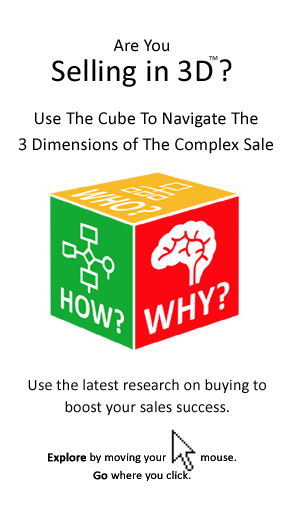 One of the key implications is that what is happening at a broader category level is now the context for your sale. Sellers must now ‘think category’ rather than simply focusing on product or solution. As well as this, sellers need to become familiar with what is happening at a category level organization-wide – not just at national level, but at regional and global levels too. In other words, they must try to identify the key trends and drivers that are impacting on how goods and services of their type are being bought and sold. With pressure for a more standardized approach organization-wide, it is important to anticipate how these trends are likely to affect the sale. Generally speaking, they will result in the degree of buying freedom or discretion available to the manager being curtailed. Follow a stricter (and generally more competitive) buying process, i.e. you are likely to have to go to tender, even if you already have a long-standing relationship. Standardize requirements, i.e. specific requirements of your local market customer may have to be cast aside in favor of an organization-wide specification. Limit the size of the vendors’ shortlists organization-wide, i.e. you may find yourself being ‘squeezed out’. Be managed by procurement specialists, i.e. purchases may now be organized centrally (even on a global level). What this demonstrates is that the trend to category-based buying has both positive and negative implications for sellers. With this in mind, we asked sales managers for their advice on how to make the category manager your friend. Is responsibility for purchasing allocated on a category-by-category basis? Are there standardized buying processes on a category-by-category basis? Are purchases centralized/pooled for key categories? If so, which ones? Are there category-level procurement-related goals/strategies/targets in place? Do they ‘buy right’ for your category? In other words, does the buying process fit the category? Do they have much experience of buying your category of product/service? Do they have (or retain) an expert in your category? Does the category buyer keep up-to-date on the supply side? Most importantly of all, the seller must be absolutely sure of what category he/she resides in, according to the buyer. This may sound obvious, but just as boxers must be weighed in before a fight, so too is it important for sellers to make sure they are in the right ‘weight category’, so to speak. Sellers can often find themselves in the wrong category, for a variety of reasons. Some products and solutions may be difficult for buyers to place in any one category or subcategory, for instance, while others may fit in more than one. Take, for example, the consulting project that is classified as ‘training’ (in order to access an available budget), but which results in a standard training tender request and a host of ‘alternative’ training providers being asked to tender. All of a sudden the consultant is competing in the world of training day rates. It is important, therefore, for sellers to try and ensure that they are in the right category, and perhaps even to influence or shape the category that they are in. The challenge for sellers is not just to know their product/solution, but also to gain an in-depth knowledge of their category. That is, they must strive to gain a deep understanding of the total set of solutions available to the buyer, including direct and indirect competitors, as well as alternative/competing technologies. This will enable them to see their solution as the buyer sees it, i.e. in the context of many competing alternatives. Sellers should also try to identify ways in which they can boost the category knowledge/expertise of the buyer. Take, for instance, an international architectural practice which, like many others, experienced frustration at poor project planning and procurement experience in its dealings with government officials in North Africa. The practice’s directors decided to turn a minus into a plus by identifying ways in which it could share best practice in the West with those on the ground in Africa in charge of buying. It’s hardly surprising that experts should want to talk to experts; due to their level of knowledge and expertise, they are much less interested in – indeed, perhaps even averse to – PowerPoint shows and marketing babble. Because of this, sales teams should strive to match their domain experts with those of the buying organization. The easiest way to define a category is to map its vendors against each other along certain key criteria. With this in mind, you need to ask yourself whether category managers will know where to place you within the particular category. In other words, is your positioning as clear as it could be? Analysts have made buying easy for many category experts by screening, sorting and mapping competitors along key criteria (see, for example, the ‘magic quadrant’ concept by Gartner). In the same way, you will want to help the category buyer to position your company against alternative suppliers. 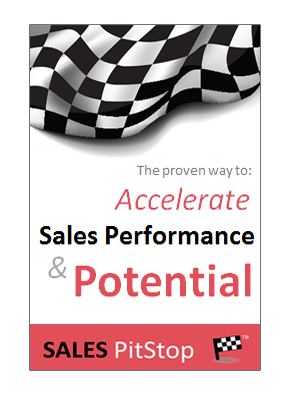 Ray Collis is author of 4 books on accelerating growth, His articles are just a sample of the research underpinning the Growth Pitstop - a powerful formula for accelerating growth. Ray is available to speak at conferences and events internationally.